The Star Game is a three-dimensional board game  for two players  invented by David Myatt in 1975  and subsequently used by the esoteric group the Order of Nine Angles (ONA) as occult sorcery  and as a three-dimensional representation of their occult system of septenary correspondences . Each occult initiate is expected to make their own boards and pieces as a part of their occult training. The game was first publicly outlined in the 1989 ONA text Naos: A Practical Guide to Modern Magick . There are two versions of the game, the simple and the advanced, with skill in the advanced form being a requirement for advancement to the ONA grade of Internal Adept . When constructed, the advanced form of The Star Game is a large physical structure, usually six or more feet in height and three or more feet in width. The simple game has seven boards placed one above the other in a spiral, with the boards named after particular stars. Each board has nine black and nine white squares, making 126 squares in total over the seven boards. Each player (white and black) starts the game with three sets of nine pieces (27 pieces per player) with each piece allowed to move across a board, and up or down from board to board, in a different way. Only some types of pieces can capture other opposing pieces, and a captured piece is removed from the boards and plays no further part in the game. The seven boards are named Naos, Deneb, Rigel, Mira, Antares, Arcturus, and Sirius. At the start of the game, each player has six particular pieces on Sirius, three pieces on Arcturus, six pieces on Antares, three on Rigel, six on Deneb, three on Naos, and none on Mira. As in other board games, the players take turns to make their moves. The basic rule of play is that after a piece has been moved – whether across a board or from one board to a higher or lower board – it is transformed into another piece according to a set sequence and then can be moved according to its new designation. Another rule is that pieces can only stay on the Mira board for three moves. The basic aim of the simple form of the game is for one player to place three of their pieces on certain squares on Mira, with the type of these pieces and their placing on that board decided by both players beforehand. The first player to do this wins the game. This takes some skill and some time since not only can an opposing player capture pieces on Mira but also pieces are only allowed to stay on Mira for three moves, after which the player must move the piece. Depending on the skill of the player, to win a simple game takes from a few hours to a day or more. In the advanced Game, each board has six (minor) boards (three at each end), with there being additional pieces (more sets of nine for each player making 81 pieces per player). There are also additional rules regarding movement. In this version of The Star Game, each board is divided into three other levels so that there are four levels to each board, making a total of 308 squares over the seven main boards. Depending on the skill of the player, to win an advanced game can take several days. In both the simple and the advanced games, the pieces are usually small tetrahedrons (or small cubes) marked with the particular abstract symbol (or the particular occult symbol) which is used to designate that type of piece. There are two ways or methods of marking the pieces with the appropriate symbols. The first way is to have a piece for each symbol, with the symbol painted or otherwise marked on the piece. This means making sufficient extra (spare) pieces to enable the pieces in play to be changed when they are moved and become transformed into another piece. For example, when an α(α) piece is moved it would be swapped for a spare α(β) which in turn would be swapped for a spare α(γ) piece, and so on. The second way is to paint or otherwise mark the face of the cube or the tetrahedron with different symbols in sequence. 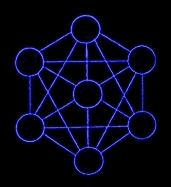 Thus, on the six faces of one cube there would be one piece with its faces/sides marked α(α) α(β) α(γ) β(α) β(β) β(γ). In use, the symbol on the top of the cube – for example α(α) – is the ‘active’ symbol, and designates the type of piece. When this α(α) piece is moved, it becomes α(β) so the cube is turned so that the α(β) symbol is at the top. On its next move, this α(β) piece would be transformed into α(γ) and the cube turned again so that the α(γ) symbol was at the top. This method of marking pieces also means that each player has to make extra (spare) pieces, although not as many as are required by the first method. 7. The septenary system of occult correspondences is unique to the Order of Nine Angles, and is represented by a Tree of Wyrd containing seven spheres (seven nexions) named after the fashion of early Arabic astrological and alchemical texts from the Middle East and North Africa – Moon, Venus, Mercury, the Sun, Mars, Jupiter, and Saturn. The whole septenary system is regarded as a symbolic (or archetypal) map of both the ‘world’ of the unconscious mind of the sorcerer/sorceress and the ‘world’ of the supernatural, with the ONA’s seven fold way – the progress of the initiate through the seven occult grades or stages – being regarded as a practical guide to attaining knowledge of both these worlds, a knowledge that enables the sorcerer/sorceress to undertake successful works of External, Internal, and Aeonic, sorcery/magick.